Life has been fast and furious lately – normal for this time of year, I guess – leaving me less time for blogging! =( I’ve still been eating (I rarely miss a meal….I’ve got too much of my dad in me haha! ), but just haven’t been taking the time to style and photograph as much as I would like. Summer is coming though and with it a few days off from work!! So in theory, I should have lots of time to cook, bake, and take pictures….in theory. We will see! 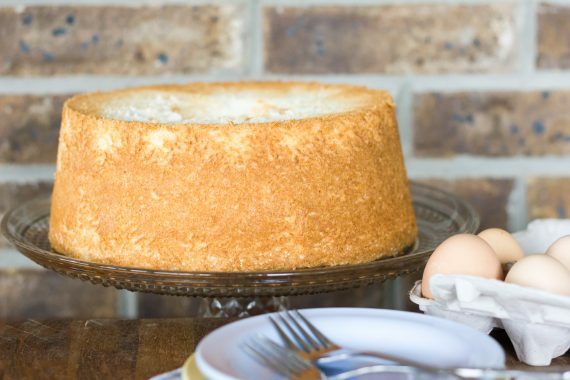 😉 But if you have a few extra minutes to spend in the kitchen this weekend, I recommend making this angel food cake! 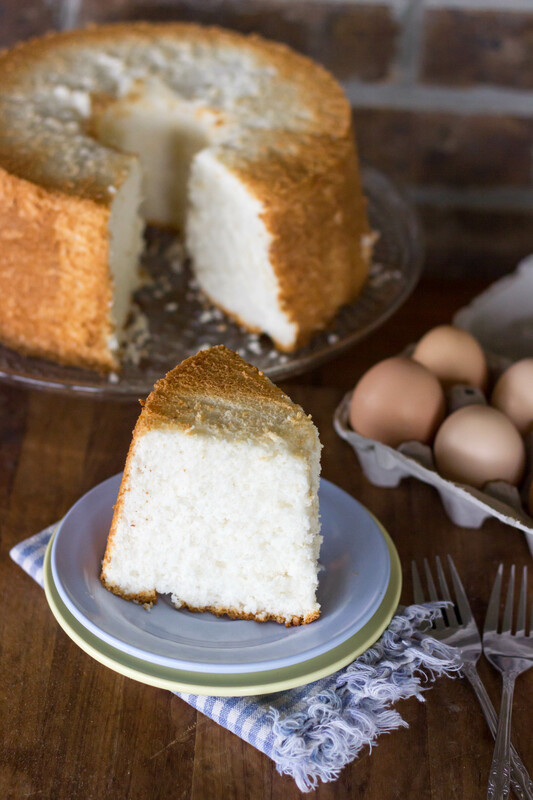 I’ve waxed on before about how much better homemade angel food cake is than store-bought…and it is soooo much better! 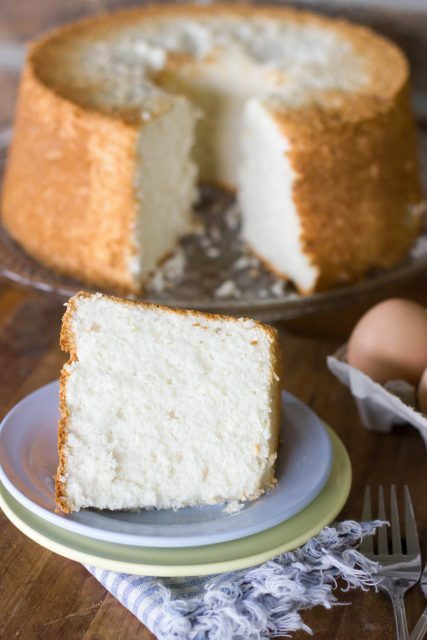 Soft, fluffy, and so moist! Perfect by itself or with fresh fruit – yum! Don’t be intimidated! It’s super easy! (Read this post for a few tips is this is your first time.) Enjoy! 1. Preheat the oven to 350 degrees F. Be sure that your 10 inch tube pan is clean and dry. DO NOT GREASE! Any amount of oil or residue could deflate the egg whites. Sift together the flour, and 3/4 cup of the sugar, set aside. 2. In bowl of stand mixer with the whisk attachment, whip the egg whites along with the vanilla, cream of tartar and salt, to medium stiff peaks. Gradually add the remaining sugar while continuing to whip to stiff peaks. When the egg white mixture has reached its maximum volume, fold in the sifted ingredients gradually, one third at a time. Do not overmix. Pour the batter into the tube pan. 3. Bake for 30 to 35 minutes in the preheated oven, until the edges appear dry and top is lightly browned. Balance the tube pan upside down on the top of a bottle, to prevent decompression while cooling. When cool, run a knife around the edge of the pan and invert onto a plate. 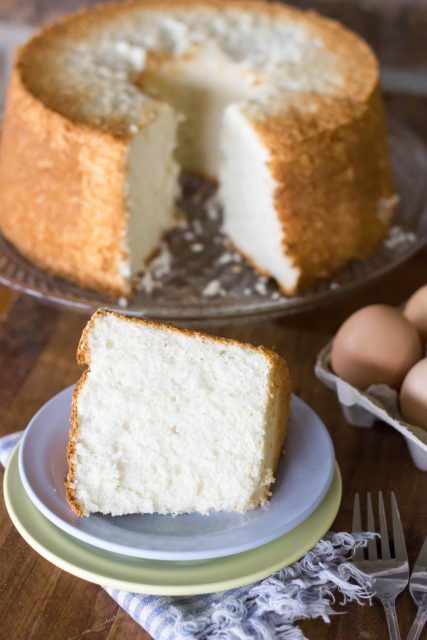 Note – Read THIS POST for tips on how to get the perfect angel food cake!